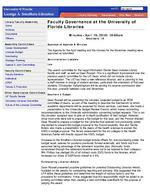 Library Faculty Assembly Home Archives Documents Officers Assembly Committees Career Development Libraries Budget Nominating Strategic Planning Special & Joint Committees Faculty Committees Faculty Senators Sabbatical SPEP Tenure & Promotion Other Governance Committees UF Faculty Senate University Libraries Committee Future of the Libraries Committee myUFL login required Library Catalog Databases Site Map SearchFaculty Governance at the University of Florida LibrariesMinutes April 19, 2010: 10:00amSmathers 1A Approval of Agenda & MinutesThe Agenda for the April meeting and the minutes for the November meeting were approved as submitted.Administration UpdatesLawThe search committee for the Legal Information Center Dean includes Library faculty and staff, as well as Dean Russell. This is a significant improvement over the previous search committee for the LIC Dean, which did not include Library representation. The LIC has hired a new reference librarian, and is planning to hire a staff member in charge of student services, particularly the orientation of first-year students. Christopher Vallandingham will be serving his reserve commission later this year, probably between June and November.Smathers & BudgetDean Russell will be presenting the Libraries projected budget to an RCM committee of deans, as part of the meeting to describe the mechanism by which academic departments will be assessed for library services. Last week, she made a presentation to the University Budget Review Council, which makes nonbinding recommendations to the University administration concerning budget requests. This is not the Libraries assigned year to give an in-depth justification of their budget. However, since most units were told to prepare a flat budget for this year, and the Provost directed Dean Russell to prepare a budget for the Libraries that restored lost purchasing power, she wished to present this budget proposal to the Council explicitly. She and Cecilia Botero also made a presentation to the deans of the health sciences to explain the HSCL's budget proposal. The library assessment for the six colleges in the Health Sciences Center will directly support the HSCL budget. Increases to the Smathers Libraries budget include offsets for: lost purchasing power, the budget recall, salaries for positions previously funded externally, and funds lost from personnel taking advantage of the retirement incentive plan. (Normally, funds surrendered through the retirement incentive were not to be restored to their colleges.) Win Phillips has pledged 2% of all indirect costs (IDC) funds to the libraries, which increases our share of DSR funds overall to 4.5%.Outstanding Librarian AwardDean Russell presented possible guidelines for potential Outstanding Librarian Award, modeled on the awards for outstanding teaching and advising. She suggested that the LFA refine these guidelines and determine the weight of various factors, and the procedure for nominations. It was suggested that this responsibility might be added to an existing committee rather than creating a new committee specifically for the purpose of judging this award.